Most UDISON customers know that the new acoustic system and unique digital signal processing technology bring the best listening experience for them, and professional engineers have developed leading audio technology to reduce intermediate profits. Appearance can be copied, good sound quality can not be copied. 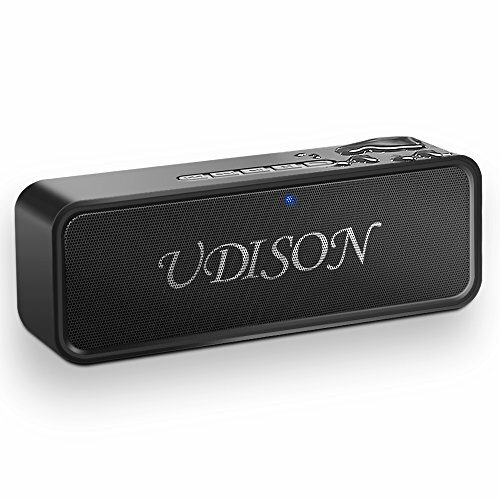 UDISON delivers impressive audio from the amazingly fashionable speaker. The speaker features 2*3W sound drivers blasting clear and robust sound, delivers Total Harmonic Distortion (THD) at 1%. Thus, we have significant clarity in audio sound and stronger bass compared with many ordinary speakers. The latest battery management program, 12 hours /250 song, efficient, lasting and stable transmission. It can also be used as outdoor emergency mobile power, charging for mobile phones or tablet PC, plug and play, charging fast. The latest and advanced Bluetooth 4.2, consume less power but offer extended 69 ft connectivity range. Small size, while fit a battery with decent capacity.Support FM radio. Its modern, fashion, artistic, natural and practical design ingeniously embellishes and grows artistic life taste. The Bluetooth speaker also features effortlessly-functional speakerphone facility. This feature makes it very handy to make phone calls with an easy push of the button while driving or jogging. The speakerphone sounds perfectly audible and clear even when you are outdoors. Because of the digital microphones, the call connecting speed is fast. √【The UDISON Advantage】: New products ranked first in the third quarter of 2017. Sound quality core upgrade, super sound quality experience, ultra high-performance price ratio. Offers 18-month worry-free Guarantee and lifetime customer service. √【3D Stereo Bass Dynamic Bassup +】: Built-in boost smart chip and passive radiation enhanced subwoofer to achieve 3D stereo dynamic bassup+. 3W + 3W high-performance precision acoustic driver achieve enhanced bass. Make you feel like sit in a concert hall. √【Advanced Bluetooth 4.2+EDR Wireless Technology】: Instantly connect to bluetooth devices from up to 66 feet away within 3s without delay. Compatible with all Bluetooth-enabled devices: iPhone, iPad, Mac, Android, Laptop etc. Automatically memory Bluetooth. Non-Bluetooth devices use the included 3.5mm audio cable connected to the AUX Mode. Up to 12 hours of continuous playtime. √【Incredible IP65 Waterproof】: Waterproof HD speaker with waterproof button, splash proof surface. Daily normal waterproof adapted for both outdoor and indoor, no - diving. The rugged sturdy exterior design tightly protect the speaker inside to realize shockproof, anti-drop and anti-scratch effect. Ideal for outdoor sports or travel. √【HD Hands-free Calling】: Built-in HD Mic, wind elimination and noise reduction technology. More humane design with intelligent and automatic caller id voice reminder. In a single gesture, enjoy the wireless HD hands-free call immediately when drive / kitchen / busy work , as clear as face-to-face dialogue. If you have any questions about this product by UDISON, contact us by completing and submitting the form below. If you are looking for a specif part number, please include it with your message.